Considered a safe and highly effective contraception method, intrauterine devices (IUDs) may also be quietly offering protection against the third-most common cancer in women worldwide. A new study from the Keck School of Medicine of USC has found that IUD use is associated with a dramatic decrease in the incidence of cervical cancer. The systematic review, published in Obstetrics & Gynecology on Nov. 7, is the first to combine data from multiple studies on IUDs and cervical cancer. The analysis included data from 16 high-quality observational studies involving more than 12,000 women worldwide. Results showed that in women who used an IUD, the incidence of cervical cancer was a third lower. The number of women diagnosed with cervical cancer is steadily rising. According to the World Health Organization (WHO), approximately 528,000 women were diagnosed with cervical cancer worldwide in 2012, and 266,000 women died from the disease. By 2035, the WHO projects that those numbers will climb to more than 756,000 and 416,000, respectively. 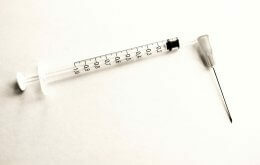 For women in developing countries, where cervical cancer prevention resources such as the human papillomavirus (HPV) vaccine or regular cervical screenings are scarce, and where populations are increasing rapidly, a contraceptive that offers protection against cervical cancer could have a profound effect, Cortessis said. Even if the rate of cervical cancer remains steady, the actual number of women with cervical cancer is poised to explode. Should gynecologists begin recommending IUDs for protection against cervical cancer? Not quite yet, but it could be on the horizon. Understanding the mechanism of action behind the protective effect of IUDs is the next logical step, Cortessis said. Some scientists speculate that the placement of an IUD stimulates an immune response in the cervix, giving the body an opportunity to fight an existing HPV infection that could one day lead to cervical cancer. Another possibility is that when an IUD is removed, some cervical cells that contain HPV infection or precancerous changes may be scraped off. If researchers can demonstrate that the body mounts an immune response to having an IUD placed, for example, then they could begin investigating whether an IUD can clear a persistent HPV infection in a clinical trial, according to gynecologic oncologist and study coauthor Laila Muderspach, chair of obstetrics and gynecology at the Keck School.